Select 6½ cups of fresh or frozen fruit. 2. Wash, cap, and stem fresh fruit and crush in a saucepan. Heat to boiling and simmer until soft (5 to 10 minutes). 3. Strain hot through a colander and drain until cool enough to handle. 4. 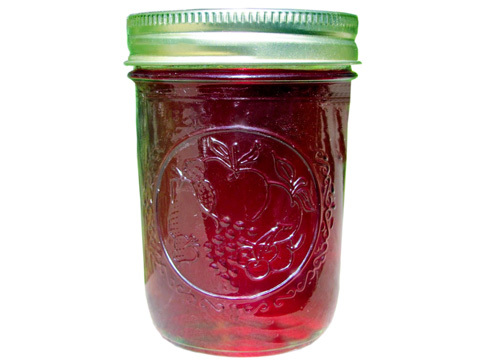 Strain the collected juice through a double layer of cheesecloth or jelly bag. Discard the dry pulp. The yield of the pressed juice should be about 4½ to 5 cups. 5. Combine the juice with 6¾ cups of sugar in a large saucepan, bring to boil, and simmer 1 minute. 6. To make a syrup with whole fruit pieces, save 1 or 2 cups of the fresh or frozen fruit, combine these with the sugar, and simmer as in making regular syrup. 7. Remove from heat, skim off foam, and fill into clean half-pint or pint jars, leaving ½-inch headspace. 8. Wipe rims of jars with a dampened clean paper towel; apply two-piece metal canning lids.